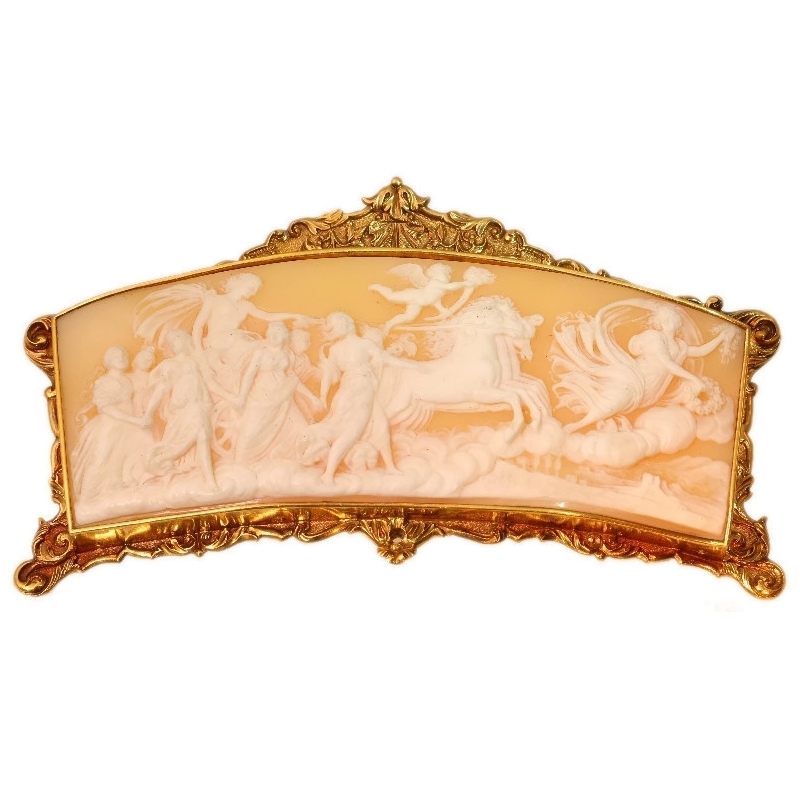 Superb Baroque style French cameo with gold mounting. A true collectors item! : Description by Adin Antique Jewelry. Superb Baroque style French cameo with gold mounting. A true collectors item! This glorious Italian Cameo is with its French 18K yellow gold mounting from 1820 in Baroque style on the verge of legendary. Like the sun rises in the east, so will you transcend like a goddess from the crowd with this masterly engraved miniature of a ceiling fresco from Guido Reni commissioned by the Borghese family in 1613 and 1614. Not only every detail is exquisitely crafted, but the warm colours reinvigorate the Roman goddess of dawn even more from her own mythos, conformed to be proudly worn as a tiara or belt. Antique jewelry object group: Miscellaneous; the piece was most probably part of a tiara or belt. There are braces at the back of the piece through which a ribbon can be lead. There is also a little hole with screw wire at the bottom of the piece, we think that this is the part where the mounting could have been attached to the skeleton of a tiara. Technique: Cameo is a method of carving, or an item of jewellery or vessel made in this manner. It features a raised (positive) relief image. There are three main materials for Cameo carving; Shells or Agate (called a Hardstone cameo), and glass. Cameos can be produced by setting a carved relief, such as a portrait, onto a background of a contrasting colour. This is called an assembled cameo. Alternately, a cameo can be carved directly out of a material with integral layers or banding, such as (banded) agate or layered glass, where different layers have different colours. Sometimes dyes are used to enhance these colours. Cameos are often worn as jewellery. Stone cameos of great artistry were made in Greece dating back as far as the 6th century BC. They were very popular in Ancient Rome, and one of the most famous stone cameos from this period is the Gemma Claudia made for the Emperor Claudius. The technique has since enjoyed periodic revivals, notably in the early Renaissance, and again in the 17th, 18th and 19th centuries. If a cameo is of good quality you don't look at the flyaway veils and voiles or curly hairstyles. Those give the artist his the liberty to make it as he wants. Instead look at the faces and hands: when those are realistic, then the artist is a good craftsman. With this cameo, although the faces are really small (and therefore harder to make realistic) they are not just good, they are terrific and showing the hand of a true master engraver. Although we believe the mounting of this cameo to be French the chance that the cameo is also French we think is rather small; we believe it to be Italian. It was not uncommon in those days that specialized workshops just made cameo's that they would export; a process that actually still exists in our days. Since the cameo is made after a fresco it wouldn't make much sense trying to find period specific characteristics on it. To find out the period in which this piece is made, we have to study the mounting thoroughly. Easiest would be if it there were hallmarks giving away the date. Unfortunately they are unfindable. The only mark we found is most probably a master mark, and to find out who owned that mark is like finding a needle in a haystack. We added a picture of this master mark. When looking at the characteristics of the mounting it has clear signs of the Baroque period. Only problem we have here is that the Baroque period lasted roughly 150 years, from 1600 till 1750 and that we found a French hallmark depicting a ram's head. This mark was in use since 1817.